Not everyone has a handheld device a la an iPhone or Blackberry. Nor does everyone have an eReader (Kindle, nook, etc.). As of this moment, I don't own either. As of December 25, 2009, I own a Kindle 2. Fortunately for those who aren't willing to pay for one of those options there remain other ways to read eBooks: on your PC or Mac. 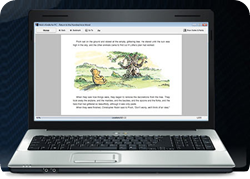 Now a desktop or laptop is not the best way to read eBooks. LCD technology by its very nature causes eye fatigue of varying degrees, and few people enjoy curling up in bed with their laptop or tablet. Sitting at my desk, with my laptop open, I rarely do more than read short stories or quickly scan through something longer to see if it's something I might want to print. That being said, I still wanted to scope out the available eReader applications available for your PC or Mac. I'll take a look at each of the eBookstores from my previous post and list the eReader app each requires you to install in order to read eBooks from their store. That last statement perhaps is worth commenting on: many eBookstores have their own application you will need to install in order to read content from their site. If you're tech savvy enough you may be able to get away with downloading in say, the EPUB format, then import that file into some other eReader application or convert it from one format to another to satisfy the app in question, but my suspicion is that you'll be fighting DRM all the way. Other eBookstores are satisfied with offering their eBooks in a variety of formats, then pointing you in the direction of someone else's eReader application. For example, DRM-protected PDF files often require Adobe Digital Editions. My documents folder has a corresponding number of eBook folders, which has certainly cluttered things up a bit. So, here are the eBookstores with their respective eReader apps listed alongside. eBook formats: DOC/DOCX, PDF, ODF, TXT, RTF, others? eReader App: for non-DRM, you have many options. For DRM-protected content, Adobe Digital Editions.